All joking aside, we think one of the best way to experience authentic France, beyond the cities, is to visit its villages. But how do you know where to begin? Luckily, there is a label travellers can look for that guarantees an authentic French village experience. Look for Les Plus Beaux Villages de France. 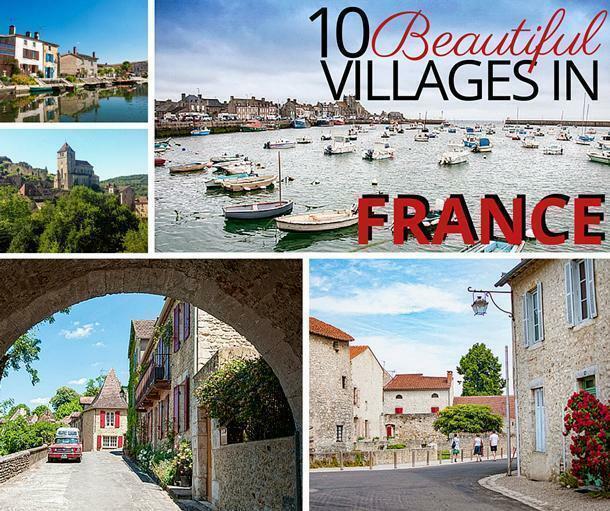 What are Les Plus Beaux Villages de France? 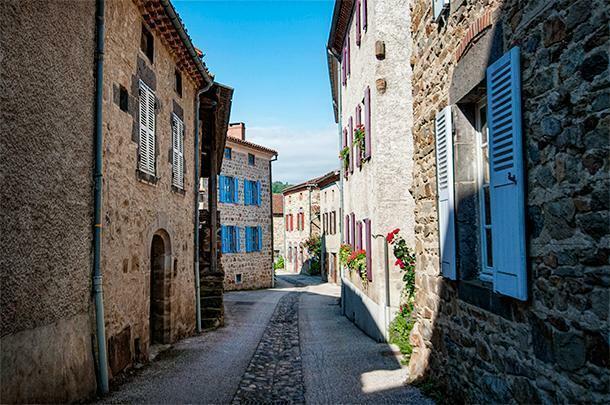 The concept came about in 1982 when the mayor of the French village of Collonges-la-Rouge spotted a photo of his village in a Reader’s Digest book called Les Plus Beaux Villages de France. It sparked the idea that tourists might be willing to discover some of the country’s pretty villages so he contacted the mayors of other cities in the book. Sixty-six of them responded and, on March 6, 1982, the association was created in the village of Salers, in the Cantal department of Auvergne. 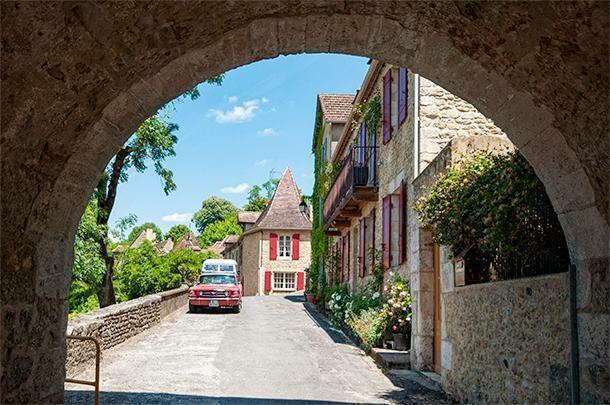 When a label translates to ‘the prettiest villages in France’ there’s a good bet you’ll find yourself in some beautiful surroundings, but Les Plus Beaux Villages have more to offer beyond a pretty façade. In addition to being beautiful, a village must have at least 2 national heritage sites, have less than 2000 inhabitants, and show a strong plan for welcoming tourists while retaining the original character of the site. The village must apply for the program (and there is a fee involved in becoming a member of the program). The application is processed, and the village is visited, evaluated, and judged by a committee. The goal is not to create ‘museum villages’ but rather to give a viable, sustainable tourism income to rural areas struggling to survive without losing the traditional character of the area. In 2015, 153 villages were listed as Plus Beaux Villages de France. 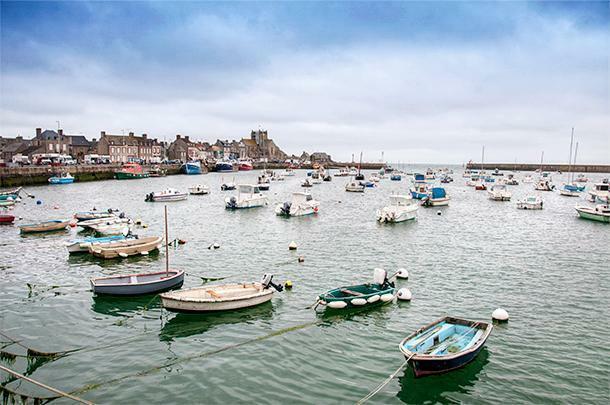 While they are spread throughout the country, the majority are in the south, with Nord-Pas-de-Calais and Champagne-Ardenne the only regions without listings. You can see a map of all of the Plus Beaux Villages here. The success of the Plus Beaux Villages designation has encouraged other countries and regions to create similar programs. 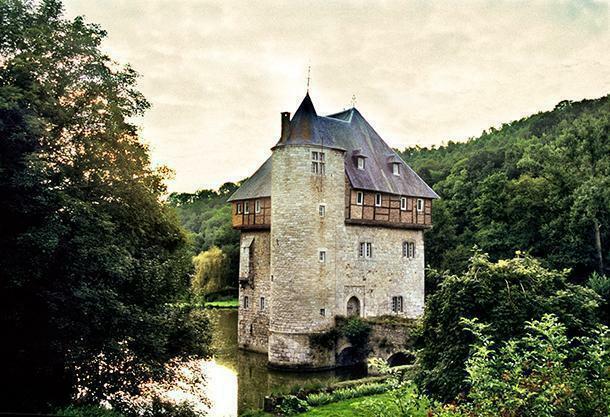 In Wallonia, Belgium you can discover Les Plus Beaux Villages de Wallonie. The Canadian province of Quebec has Les Plus Beaux Villages de Quebec. Italy has I Borghi Piu Belli d’Italia, Spain’s program is called Los pueblos más bonitos de España, Romania is, in the beginning, stages of its program and even Japan has formed an organisation. Les Baux-de-Provence was the first Plus Beaux Village we ever visited and the crumbling fortress on top was fun to explore. Les Baux-de-Provence was the first Plus Beaux Village we ever visited, waaay back in 2005, on our first weekend getaway from Belgium. We’ve returned several times since and there’s no denying the beauty of this imposing village carved out of the top of a rock. 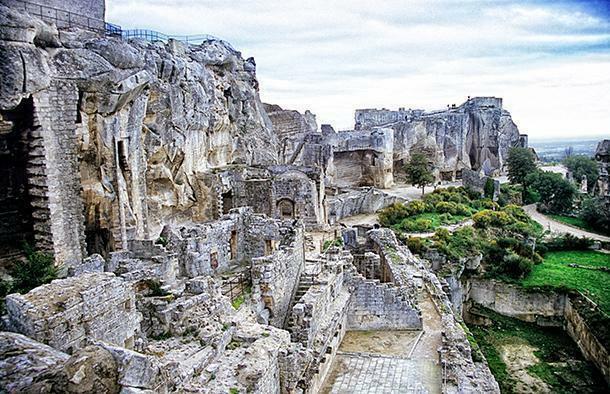 Les Baux is the most touristic of the villages we’ve visited and in the summertime, it can get downright crowded. However, if you plan your visit during the off-season you can wander around the village and fortress virtually by yourself. 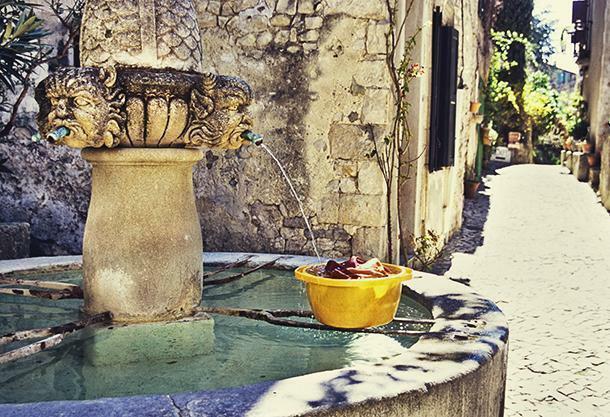 I loved the ancient water fountain in Séguret. A villager was even doing her washing here. The following year, we found ourselves in Séguret by accident while visiting the region with my parents. 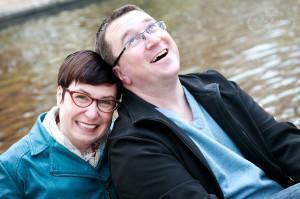 We found it so charming, we returned later that year with Andrew’s parents. As luck would have it, a group of local artists was painting in the streets. Andrew’s father, an avid artist himself found plenty to discuss even without a shared language. My favourite feature of the village, besides the spectacular view, was the ancient water fountain still used by the locals. Last summer, I wanted to continue our exploration of France’s Plus Beaux Village in earnest, and my mission was to stop in as many as we could. The first one we came across was during our road-trip through Manche in Normandy – and we were just in time for lunch. It was a grey day but the weather didn’t dampen the picturesque atmosphere of the fishing village. The harbour was lined with seafood sellers and we bought our first spider crab. I also particularly loved the cosy church, huddled beside the coast. 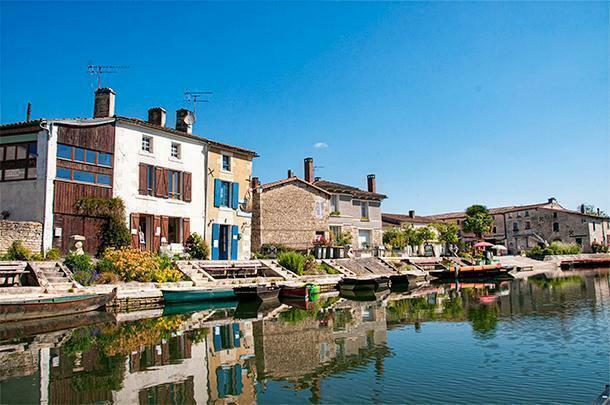 The Marais Poitevin draws tourists to Coulon but the village itself is beautiful too. We didn’t even realise Coulon was a Plus Beaux Village when we visited, as we were there to see something altogether different – the marshes of the Marais Poitevin. Poitevin marsh draws plenty of visitors and Coulon has capitalised on this, offering a number of excellent restaurants, shops, and attractions for tourists. Be sure not to miss the excellent museum of the marshes and enjoy a fantastic meal of local ingredients at Restaurant Le Central. Of all the French departments we spent time in last summer, Dordogne has the most Plus Beaux Villages. With castles perched on seemingly every point of high ground and troglodyte homes carved straight into the cliff face, it’s no wonder. 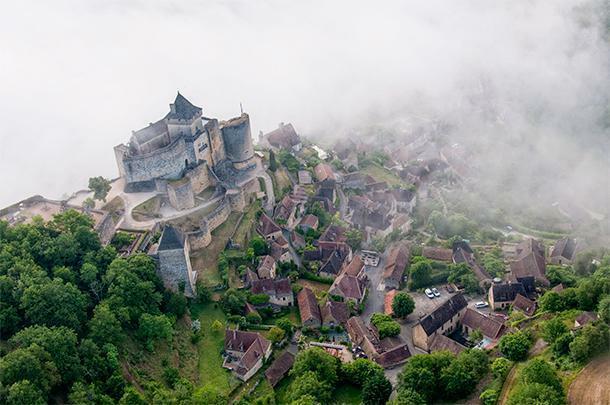 Beynac-et-Cazenac was one of those villages that takes your breath away as it comes into view. 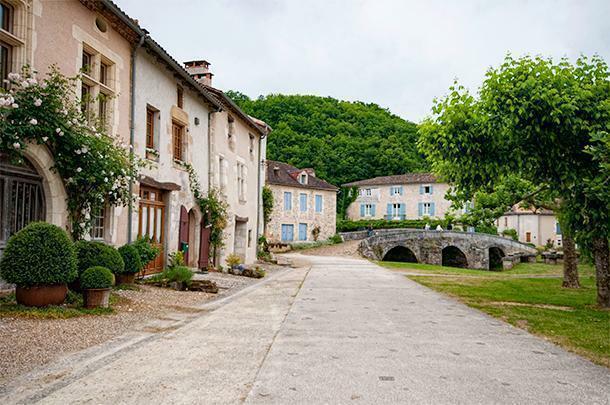 The village is dominated by Beynac castle and the road through the village hugs the river, making it a tight squeeze when driving a motorhome! What can we say about Castelnaud-la-Chapelle other than Wow! Truth be told, we didn’t technically set foot in Castelnaud-la-Chapelle, but rather, sailed over it in a hot-air balloon. Still, with this view of the castle and village, how could we not include it here? 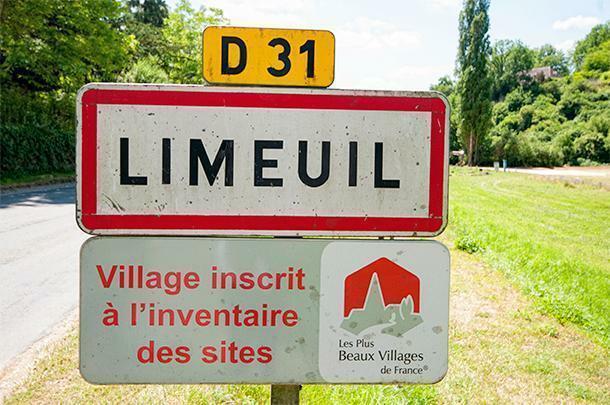 Of Dordogne’s Plus Beaux Villages, we spent the most time in Limeuil and it was definitely one of our favourites. It’s a hike to get to the top of the village but well worth it for the view of the Dordogne and Vézère rivers and for the excellent garden. We also enjoyed a great meal in the village and there were plenty of little shops and services to appeal to visitors. Limeuil was a stand-out winner in our books. 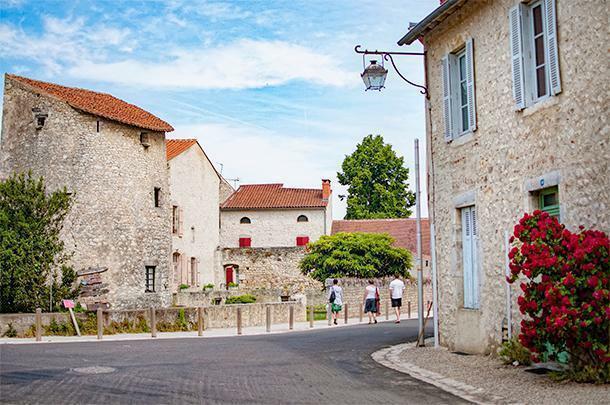 How could we not love Charroux with its artisans and gourmet treats? 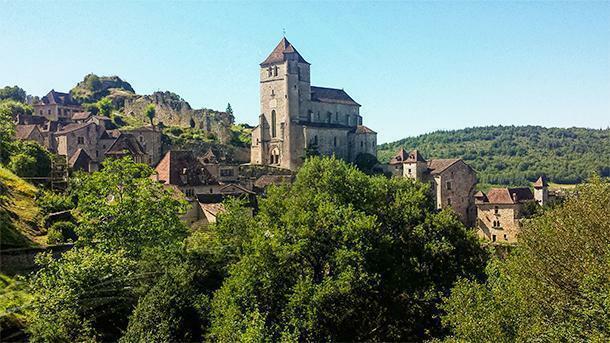 The other stand out winner from a tourism perspective was Charroux, in Auvergne. This little village had more craftspeople, producers, and artisans than we’ve seen in one small place. It’s a great destination for foodies and people who love handcrafted items. It’s an easy place to spend a leisurely day exploring and gathering goodies for a gourmet picnic. Lavaudieu was a sleepy village but pretty just the same. Lavaudieu was one of the sleepier of the Plus Beaux Villages we visited. It makes our favourites list though because it had a great free overnight parking area for motorhomes where we spent a peaceful night overlooking the river. If you’re looking for a truly rural escape, this might just be the village for you. A quick photo of Saint-Cirq-Lapopie was all we got so we’ll just have to go back! The Lot department of Midi-Pyrénées is simply breathtaking and home to some of the best drives we’ve done in France. 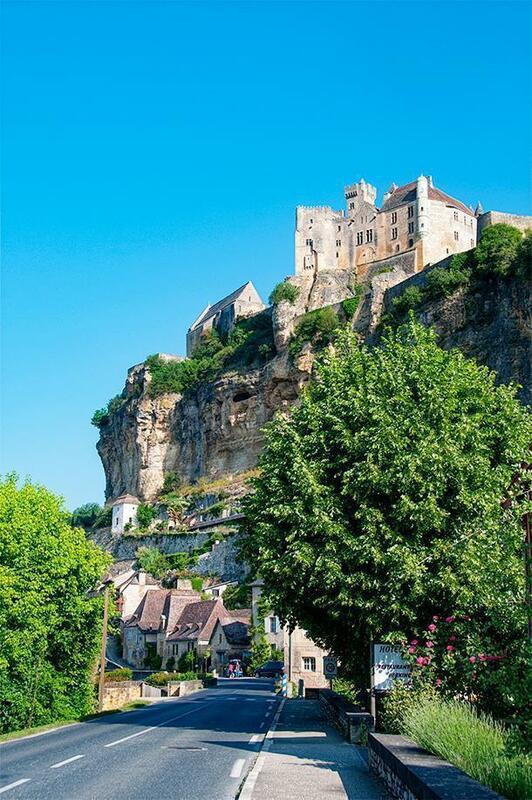 Its villages are equally stunning and Saint-Cirq-Lapopie takes the cake. Unfortunately, it’s not a great place for motorhomes and we were too pressed for time to walk in. (So much for slow travel right?) I had to content myself with this quick phone photo snapped through our motorhome window as we drove through, but Saint-Cirq-Lapopie is definitely on my wish-list for a return visit. While we’ve long known about France’s beautiful villages program and we were introduced to Wallonia’s villages a few years ago, I was surprised to learn of the other organizations. Of particular interest was Italy, especially when I spotted Umbria’s contributions to the list. 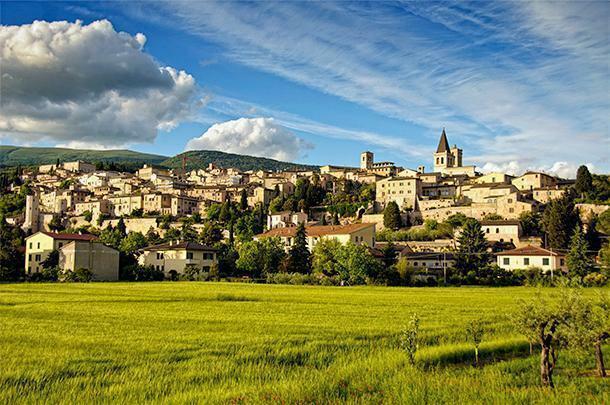 Our favourite village of Spello is one of the beautiful villages of Italy, as are Norcia (pork town to us), Montefalco, and Bevagna, all of which we visited while exploring Umbria. 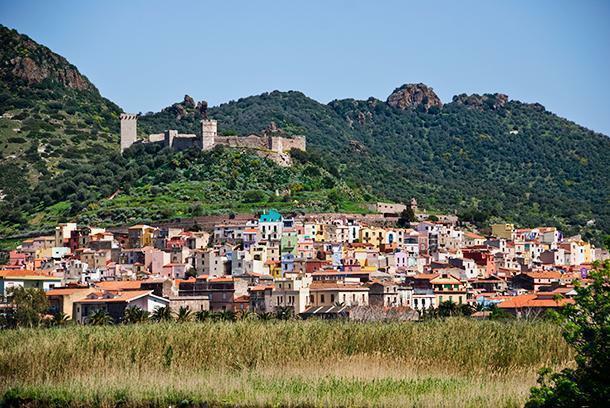 I also spotted colourful Bosa, in Sardinia, which I would agree is a very pretty village indeed. Of course, we’ve been to plenty of beautiful villages in France and around the world that don’t have any particular designation. Some have managed to remain economically viable, but many small, rural villages are struggling. Fostering sustainable tourism to these villages is one way to solve this problem but there are other ways. We’re curious to hear what you think of programs like Les Plus Beaux Villages and to learn about your favourite beautiful villages in France and beyond. Share your thoughts in the comments below. If you’re looking for more travel inspiration check out the guidebook for Les Plus Beaux Villages in France on Amazon.com and Amazon.co.uk.